The Bernard and Edith Lewin collection of Mexican Art. Gift from the above to the present owner. Exhibition catalogue, Tamayo: Recent Paintings, Marlborough Gallery, New York, 1981, no. 2 (illustrated in color). Addendum For Book 'Rufino Tamayo', B. Lewin Galleries, Palm Springs, California, n/d, no. LI (illustrated in color). 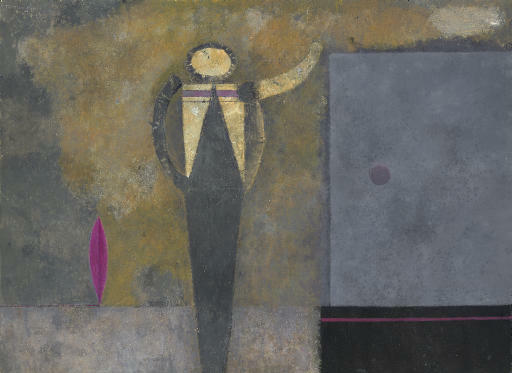 O. Paz and J. Lassaigne, Rufino Tamayo, Barcelona, Ediciones Polígrafa, S.A., 1982, p. 270, no. 249. Exhibition catalogue, Tamayo 70 Años de Creación, Mexico City, Instituto Nacional de Bellas Artes, 1987 (illustrated in color). O. Paz and J. Lassaigne, Rufino Tamayo, Barcelona, Ediciones Polígrafa, S.A., 1995, p. 272, no. 249. Mexico City, Instituto Nacional de Bellas Artes, Tamayo 70 Años de Creación, December 1987- March 1988. *This painting is sold to benefit the Los Angeles County Museum of Art, Los Angeles. Accordingly, this lot may be exempt from sales tax as set forth in the Sales Tax Notice at the back of this catalogue.